Faced with economic contraction, deflation, and tanking markets, the Federal Reserve resorted to unorthodox means to lower interest rates and pump liquidity into the market. 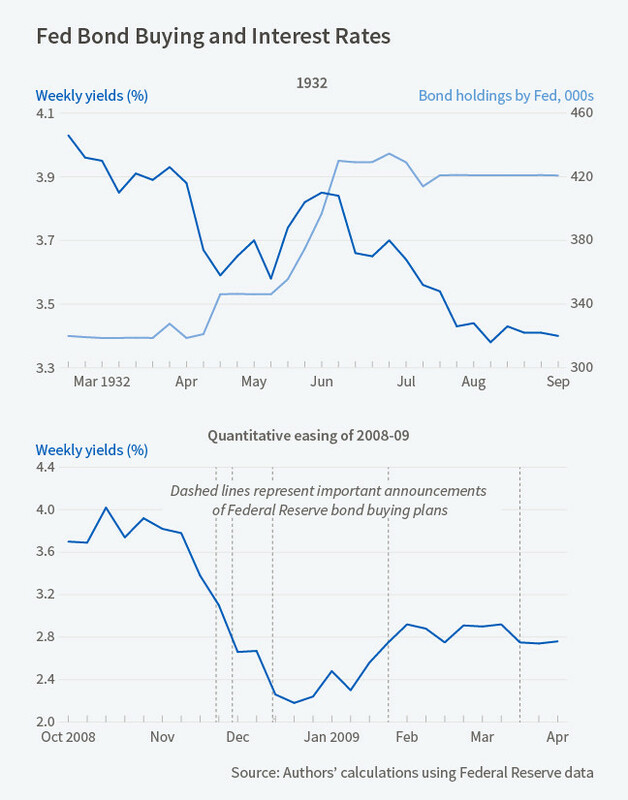 Quantitative easing of 2008-09? No. That was U.S. monetary policy in 1932, as the central bank bought $1 billion in Treasury securities over a period of two quarters and brought down interest rates dramatically. Had this policy remained in place for longer, or had the Fed adopted something like forward guidance, Michael Bordo and Arunima Sinha conclude that "the Great Contraction would have been attenuated significantly earlier." In their new study, A Lesson from the Great Depression That the Fed Might Have Learned: A Comparison of the 1932 Open Market Purchases with Quantitative Easing (NBER Working Paper No. 22581 ), the researchers use the policy action in 1932 as a prism through which to analyze the effects of the Fed's more recent quantitative easing (QE) policies. The researchers observe some similarities between the economic circumstances of 1929-32 and 2008-09, though the magnitude of the problems differed greatly. Unemployment in both eras was high and rising by standards of the day (25 percent in 1932, 8.7 percent in March 2009) and the economy was contracting (down 20 percent in 1932, 4 percent in March 2009). In both periods, Treasury yields were historically low, and Congress and the public were eager for the Fed to act. The size of the Fed's intervention in 1932—bond purchases equal to about two percent of GDP, or $16 billion in today's dollars—was roughly proportionate (in terms of GDP) to the purchases of long-term Treasury securities in the first QE program, between November 2008 and March 2009. There were some key differences, however. The U.S. was on the gold standard in 1932; in 2008 exchange rates floated freely. The Fed did not announce its 1932 intervention, nor did it give any indication of its duration or size. This was a significant difference from the situation in 200809, when the central bank delivered a drumbeat of communications as the Great Recession deepened. In 1932, the Fed's portfolio was more heavily concentrated in medium-term Treasury notes relative to bonds than it was in 2008-09. Financial markets were also much more segmented than they were 80 years later. The segmentation was manifested in the fact that it was more difficult for households to access the markets for Treasury notes and bonds compared to institutional investors. This market segmentation meant that investors couldn't easily substitute one type of government bond for another. Finally, the Fed used other unconventional policy tools in the 2008-09 period, such as the purchase of mortgage-backed securities, which it did not use in 1932. Despite these differences, the researchers argue that the Fed's Depression-era moves constitute an experiment in monetary policy that can be used to analyze the first QE program. Those moves allowed the Fed to engineer dramatic drops in interest rates in only two quarters. The interest rate on Treasury bills fell 90 basis points, yields on Treasury certificates and notes dropped 114 basis points, and Treasury bond rates declined 42 basis points. The researchers simulate what might have happened in 1932 had the Fed announced the size and duration of its securities pur-chases ahead of time and held on to those securities for an additional two quarters before selling them off in the following two quarters. Under that scenario, output growth would have risen 0.5 percentage points. This exercise suggests that the Fed's 1932 purchases were effective in reducing the risk premium for bond investors and thus bond yields. Since the markets for Treasury securities today are far less segmented than they were in 1932, institutional investors are in a much better position to arbitrage away the difference between returns on long- and short-term bonds. As a result, the Fed in 2008-09 used other unconventional tools, such as the issuance of forward guidance, to influence interest rates. In response to these Fed announcements, yields on 10-year government bonds fell 107 basis points during the period, by one measure, while five-year Treasury notes dropped 74 basis points, and one-year notes decreased 25 basis points.